With woods behind us, we are challenged with deer mice wanting to set up housekeeping in our garage. We store bird food there and having a stocked pantry is a delight to a deer mouse. One thing deer mice is portray is a character quality of contentment. 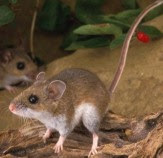 The deer mouse can make its home almost anywhere because it will make itself comfortable with whatever is available. Now and then when we are reorganizing the garage we find evidence of where the deer mice have stored night time snacks. We also find their sleeping and cozy warm areas in boots, small boxes tucked behind a workbench, or in anything that would not be moved about on a regular basis. Inside these nests are pieces of fabric from rags lying around, leaves, and sometimes chewed pieces of things we wished they hadn't chewed on. They are creative and make use of what they can find and are totally content with their circumstances ... whether we are or not. Sometimes we have to focus on another spiritual quality to be able to hold ourselves up in a weak area. One such quality related to self-control is contentment. We are surrounded by a world where people have everything in excess. It's been about more and more and more for so long. We need to learn to settle into being content and it will afford us much greater self-control. Some people I know believe in having a back-up of many things they own. They have an extra tv, extra tools, extra appliances, extra umbrellas, etc. It's like we're expecting everything to break and need to be replaced. I'm always amazed at how stores can sell extended warranties to people. My first question when they're offered to me is this: "So are you telling me this thing I am about to purchase is going to break before a year passes?" That would cause me to want to research a bit deeper on the performance statistics of that product. I can't see paying a company for a product and then paying them "insurance" in case it breaks. I just can't grasp that at all. On our journey out of debt, it was amazing the things we found that we didn't know we had when we couldn't run out to buy something else. Our brains became more creative in seeing new ways to do things. As we sold things to pay off debt, our lives and minds became more peaceful. everything I need for my present and future happiness. Sometimes we expect things to make us feel better. When we look to stuff for our significance, that stuff becomes idols. Only God can give us true joy, peace of mind, and love enough to cover all of our greatest needs. The less we have to maintain, the more time we can spend with our Father and that time will reap rewards you would never have dreamed possible. We become like who we hang around with. The Bible tells us to choose our friends very carefully in this life. He who walks with wise people will become wise himself, but that he who keeps company with fools will he himself be destroyed. Don't we make ourselves companions with our stuff? Especially electronic gadgets. It's what we spend our time on and what relationships do we trade for it? What lifestyles do we form from it? Is it time to consider what we want our lives to really look like? Maybe a bit of contentment needs to be added to yours?